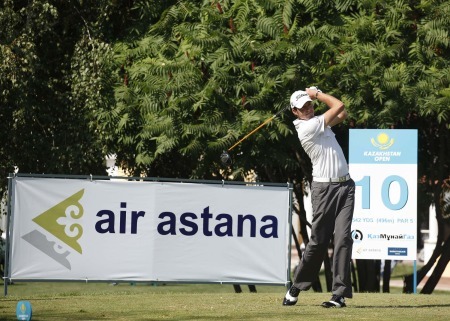 The former Royal County Down assistant, who finished in a tie for 21st place on his only previous visit to Kazakhstan two years ago, embarked on a birdie blitz on another day of high temperatures at Nurtau Golf Club, in Almaty, where he covered the front nine in just 31 shots. The 34-year old made another gain at the tenth hole, before dropping his only shot of the day at the par three 14th hole. But he finished on a high note with his seventh birdie of the day on the last to sign for a round of 66 which moved him to 11 under par, two shots clear of the rookie duo of Norway’s Knut Borsheim and 19-year old Englishman Chris Lloyd. “I just tried to carry on doing what I did yesterday, because when you’re playing well sometimes you can start to get a little bit negative,” said Thornton, who would secure a return to the European Tour with victory tomorrow. “That’s just the way the human mind works. But today I got off to a great start, starting holing some nice putts, and managed to keep the momentum going. Colm Moriarty is nine strokes behind Thornton in a share of 28th place on two under after an uneventful 74 while Niall Kearney made the level par cut on the mark after a second successive 72. Borsheim, who is playing under a sponsor’s invitation, was equally delighted after signing for a flawless round of 65 to surge from tied 20th place overnight to a share of second place. The young Norwegian, who graduated from Arizona State University in America last year, has shown little in his six previous appearances on the Challenge Tour to suggest that he would play a leading role this week, with a tie for 31st place at the Acaya Open his best performance to date. But Borsheim revealed he has been struggling with chronic fatigue, and has only recently returned to full fitness. He said: “I just felt tired all the time. I could hardly get out of bed in the morning, and had no energy to practise or play golf. I just had to be nice to my body for a while, because I think I was probably exhausted from college, and studying, and playing a lot of golf. I’ve got another scan in October to try to find out what the problem is, but at the moment I feel absolutely fine, which is probably why I’m playing much better now. Chris Lloyd is tied for second in Almaty. Picture by Phil Inglis.Lloyd is feeling increasingly at home on the Challenge Tour this term, having turned professional last year following a glittering amateur career which included two appearances in the Junior Ryder Cup and victory in the Jacques Léglise Trophy in 2009. The Bristolian endured an indifferent front nine, with consecutive bogeys from the eighth hole cancelling out gains at the fourth and seventh, but he more than made amends with a blistering back nine which included four birdies. 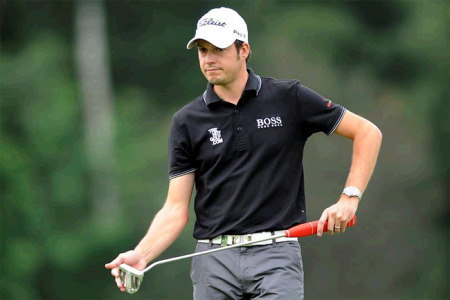 Lloyd, currently 21st in the Challenge Tour Rankings, said: “I played much better today than I did yesterday. I only missed two greens all day, on the two holes I bogeyed. It was a bit frustrating to turn in level par because I felt I deserved more, but then after the turn I played well – especially the last seven holes, which is the best I’ve played in a long time. I made some nice putts on the way in, which gives me a lot of confidence going into the weekend. Lloyd’s compatriots Tommy Fleetwood and Sam Walker currently share fourth place on seven under par after carding respective rounds of 69 and 65. Tommy Fleetwood with the Kazakhstan Open trophy. 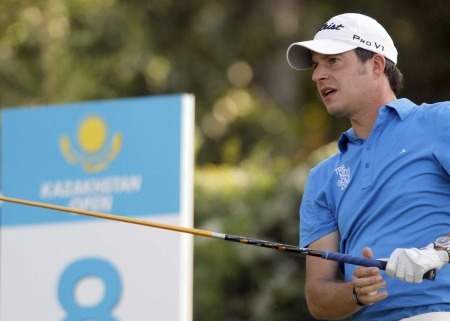 Picture by Phil Inglis.Simon Thornton was rocked by a double bogey at the first but hopes that the closing birdie that gave him a share of third in the Kazakhstan Open could prove to be priceless at the end of the season.